L’ASIE/Dressée sur les Observations de l’Academie/Royale des Sciences et quelques autres, et sur/les memoires les plus recens./Par G. de l’Ifle Geographe./a Amfterdam/Chéz PIERRE SCHENK,/sur le Vygendam a l’Atlas d’ Sanfon/ Avec Privilege 1708. 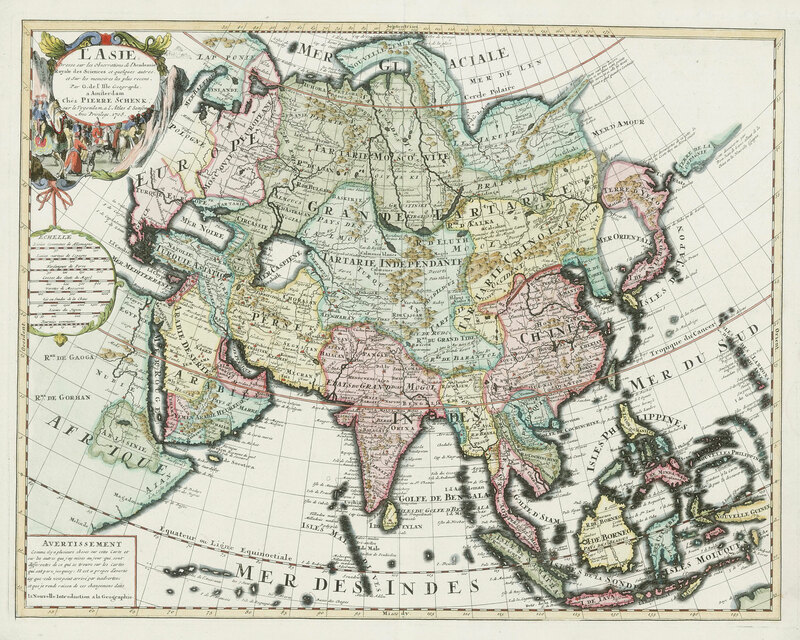 A very attractive and rare early 18th century coloured map of Asia by Pieter Schenk (1645-1715), a German engraver and publisher based in Amsterdam who worked closely with Gerard Valk and acquired the plates to Jansson’s Atlas Novus and the rights to publish copies of Nicolas Sanson and Guillaume De L’Isle’s maps at the end of the 17th century. 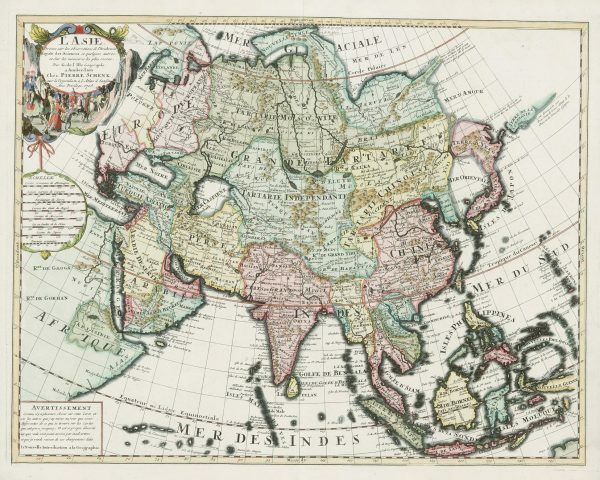 This map, published in 1708, is a revised version of De L’Isle’s general map of the Asian continent first published around 1700, and probably appeared in Schenk’s Atlas Contractus sive Mapparum Geographiacarum. This later edition differs from De L’Isle’s first edition in having detail of the coastline of north-eastern Siberia between Novoya Zemly and Terre de Yeco. Very good condition overall, very strong impression on thick paper, measures 443 x 577 mm.